Baron Fig provided this for review purposes. A year or so back, I bought a Parker Jotter. It's a classic ballpoint pen, of course, and that's the reason I bought it. I figured I needed one decent ballpoint in my arsenal and I love the retro two-tone look. It's also got a very satisfying click. Loud, solid, and super annoying to anyone in a 10 foot radius if you are a fidget clicker. The refill was decent, but not ideal, especially when compared to some of the liquid rollerball pens I'd been using. So on the search for a better refill, I stumbled across the Schmidt EasyFlow 9000. The ink is great, very smooth, and dark for a ballpoint (the black is, anyway). And the flow is, well, easy. You don't really need to press like with a standard Bic ballpoint. It flows out like a decent gel pen, but with all the ballpoint benefits, like writing on receipt paper, glossy paper (like some greeting cards). I was sold on this refill and therefore found a ballpoint I liked. 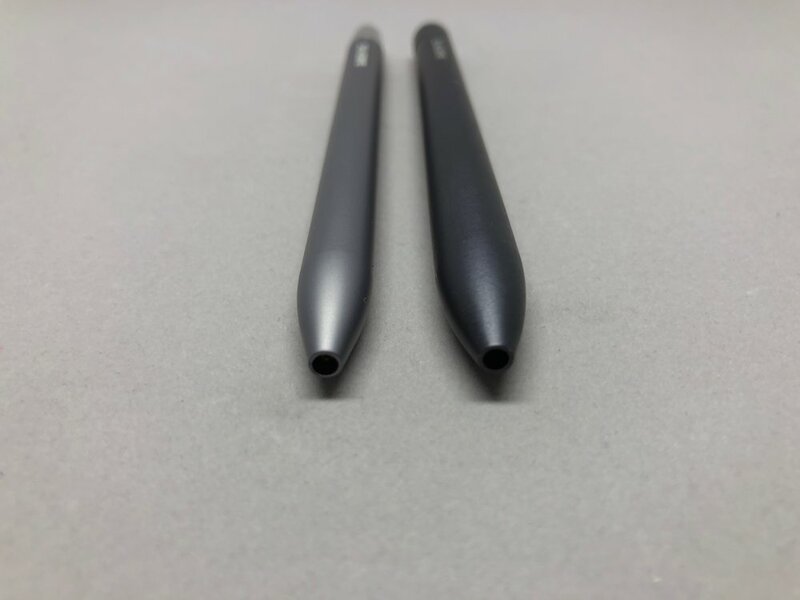 When I opened the Squire Click package from Baron Fig, I actually didn't know it was a ballpoint at first. I thought it was just a Squire with a click mechanism. I thought it used their standard Schmidt P8126 rollerball refill. And I was excited for it. Then I wrote with it. I could tell immediately upon clicking that the the point was a little fatter, but the line wasn't once I put it to paper. It did feel different, though. "Is this a ballpoint?" I said aloud, with only a napping Luna to hear me. I took it apart and found, yeah, it was a ballpoint. A Schmidt EasyFlow 9000 refill, to be exact. I hadn't used my Jotter for a long while, so I wasn't prepared for this. And the fact that I had to ask out loud if it even WAS a ballpoint should tell you that the refill is great. Still, I kinda wanted this to be the standard Squire refill. I didn't pay attention to the announcement at all, apparently! I tried to swap with a Squire rollerball that I had. No dice. It is machined perfectly for this refill. The EasyFlow 9000 refill, while technically in the same category of refill (Parker-style G2, not to be confused with the Pilot G2 pen), is thinner than the Schmidt P8126 rollerball refill and the P8126 won't fit in the Squire Click. The EasyFlow 9000 will fit in the standard Squire, however. So before we dive deep into the differences, let's talk about the similarities. 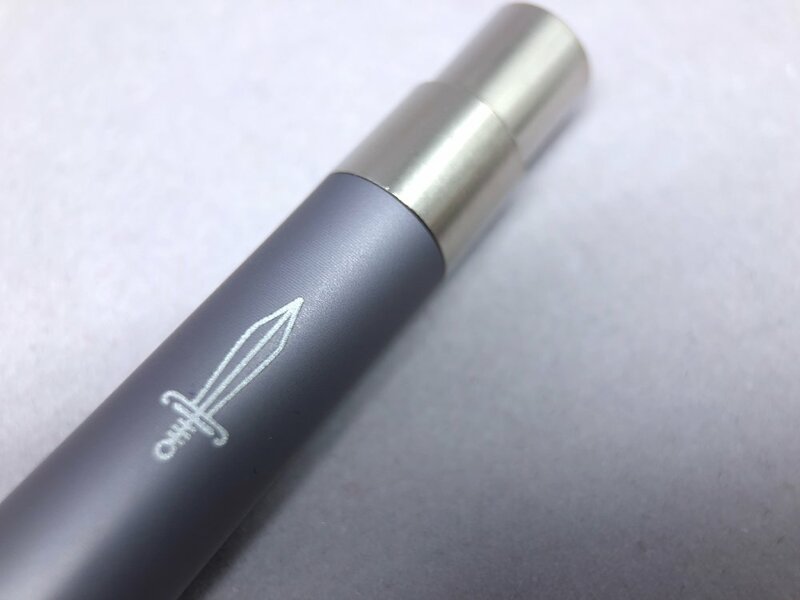 The Squire Click is machined aluminum, just like the Squire, and is available in 2 colors, Fig Wine and Charcoal. It's minimal and very simple: body, click mechanism, spring, and refill. That's it. Just like the Squire. And just like the Squire, the Squire Click doesn't come with a clip. They both come in that nice tube. And that's about it. The Squire Click isn't tapered like the Squire, or if it is, it's not noticeable to the naked eye. I didn't go out and buy a pair of calipers to test it. It's thinner than the original at its thinnest point. When engaged the original is longer, but when both aren't engaged, the Squire Click is longer, so that puts them close enough to the same average length, which is about 5 inches. The tube and website list the Squire Click at 1.05 ounces, but it's lighter than the Squire, which is 0.85 ounces, so that has to be an error. Upon weighing it myself, on 3 different scales (kitchen scale, mail scale, "not a pot" scale I bought for measuring for last year's sharpener series), the Squire Click weighs in at just over 0.7 ounces. I like this weight very much. Being the pencil pusher I am, I'm all about lightness in writing utensils. The standard Squire is about the heaviest I want to go for a long-session writer, so this one earns points for coming in under that. The Squire Click and the Karas Retrakt use the same Schmidt mechanism. The click mechanism is the same as the Karas Custom Retrakt clicker, which is made by Schmidt. I like it, it's a good clicker, kinda quiet. Karas reminds people that these are all machined metal parts, so fidget-clicking is discouraged. I would assume the same goes for this one as well, but no such warning from Baron Fig. If you do end up messing it up somehow, the replacement part that Karas sells will definitely fit into the Squire Click (I swapped mine around to test this and it worked perfectly). Overall, this is a pretty sweet pen, although I do wish it was made with the ability to swap in the Squire Original refill. That's probably my only gripe with it. The weight is nice, the refill they chose is the best ballpoint, in my humble opinion. Sure, there's an argument to be made about a clip, but I'm not in the "crazy about clips" camp. For $45, this is a high quality body that fits a high quality ballpoint refill, and has a really great and, if needed, a replaceable clicker. If you like this style, this ballpoint will last a long time. Available from Baron Fig, $45.